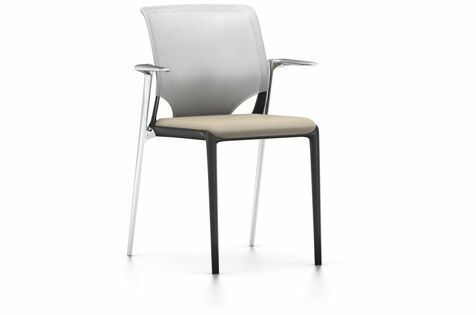 MedaSlim by Alberto Meda is an exceptionally robust visitor and conference chair with a sleek design and excellent user comfort. The front legs, backrest frame and seat are moulded in one piece thanks to an ingenious production process. The MedaSlim model with chrome-plated legs can be stacked up to 5 chairs high. Polyurethane foam padding with fabric or leather cover. Die-cast aluminium with polished or chrome-plated finish or powder-coated in basic dark. Backrest frame, front legs and seat shell moulded from a single piece of fibreglass-reinforced polyamide (basic dark). Back legs in aluminium with polished or chrome-plated finish or powder-coated in basic dark. MedaSlim can be equipped with row connectors and row numbering elements for mass seating. Only MedaSlim chairs with chrome-plated legs are suitable for stacking. The polished and powder-coated versions should not be stacked as this could scratch the surface.